Comedy writers Laurence Marks and Maurice Gran say that twenty years on while there are no plans to bring the show Goodnight Sweetheart back to television they are "some way down the line of doing a stage musical"
Marks and Gran are the writers of the very popular musicals Dreamboats and Petticoats and Save the Last Dance for Me which are both currently on tour, with other TV shows including Birds of a Feather, Relative Strangers, The New Statesman and Shine on Harvey Moon. 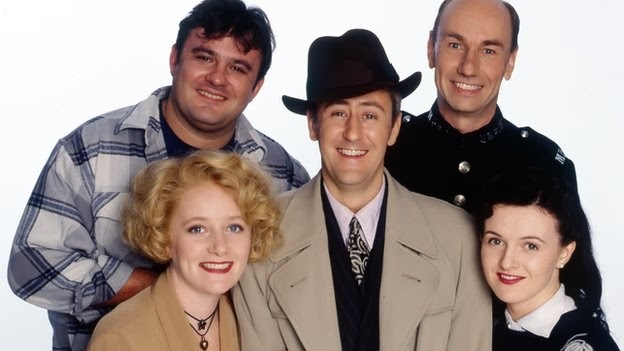 Goodnight Sweetheart ran for six series on BBC One between 1993 and 1999 with the initial cast including Nicholas Lyndhurst as Gary Sparrow, Michelle Holmes as his wife Yvonne, Victor McGuire as his best friend Ron Wheatcroft, while his war-time companions were Christopher Ettridge as bumbling PC Reg Deadman and Dervla Kirwan was the "other woman" Phoebe. Goodnight Sweetheart still has a devoted following and the writers say Goodnight Sweetheart The Musical could be ready soon and feature music from the 1940s and the 1980s.